Harcourt reports that Winston Churchill, First Lord of the Admiralty, was ‘very angry’ that the Cabinet rejected his wish to instigate a plan devised by the Committee of Imperial Defence for national war shipping risk insurance. Churchill’s hiring of the Cunard ship Acquitania and commandeering of South Wales coal yesterday have both been cancelled. The meeting of the Cabinet concluded at 1:00 p.m. following further discussion of the situation in Ireland. The Prime Minister, H.H. Asquith, told all ministers that they must not go far from London. The Bank rate has been put up to 8% and there has been a ‘considerable run on Banks for gold from depositors.’ The Prime Minister had an audience with the King between 3:15 and 4:00pm in the afternoon and then met with the Governor of the Bank of England. Harcourt’s political journal features in the Bodleian Libraries exhibition The Great War: From Downing Street to the Trenches. 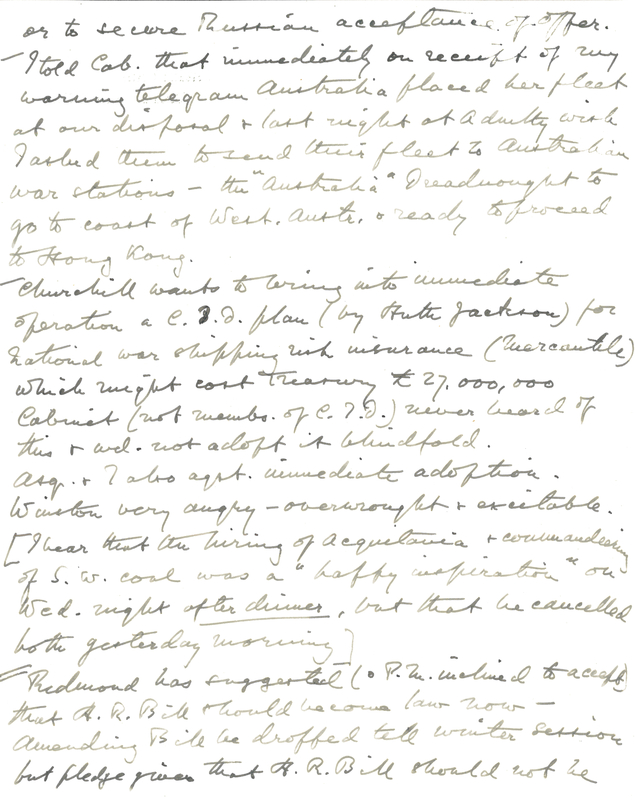 Entry for 31 July 1914 from the political journal of Lewis Harcourt (page 1). 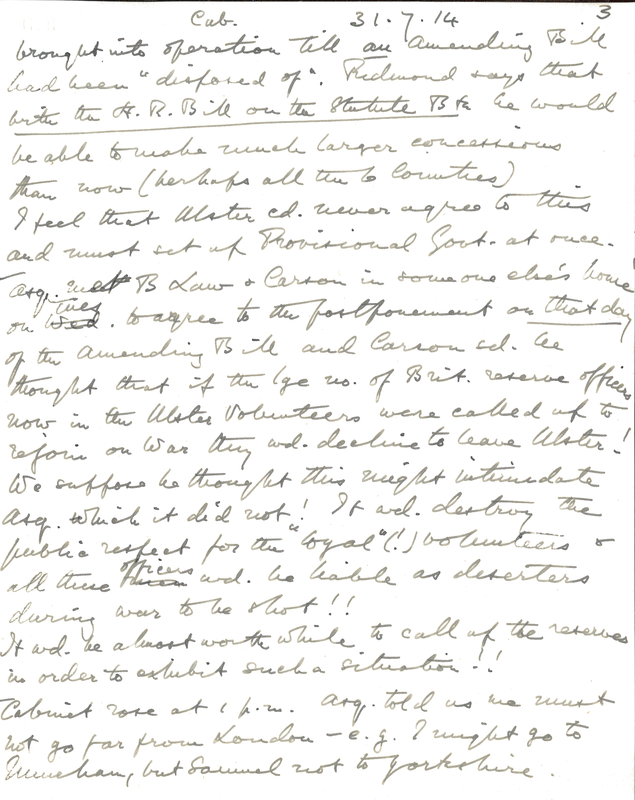 Entry for 31 July 1914 from the political journal of Lewis Harcourt (page 2). 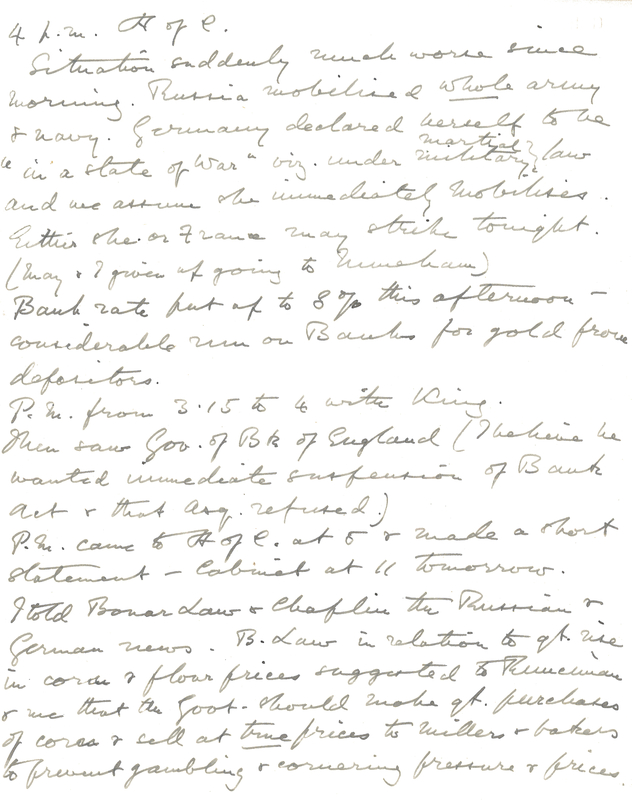 Entry for 31 July 1914 from the political journal of Lewis Harcourt (page 3). 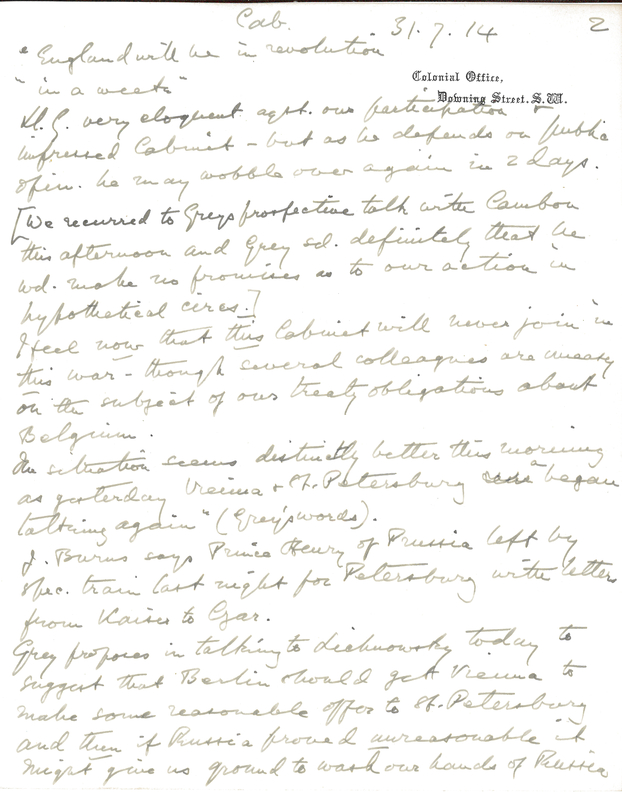 Entry for 31 July 1914 from the political journal of Lewis Harcourt (page 4). 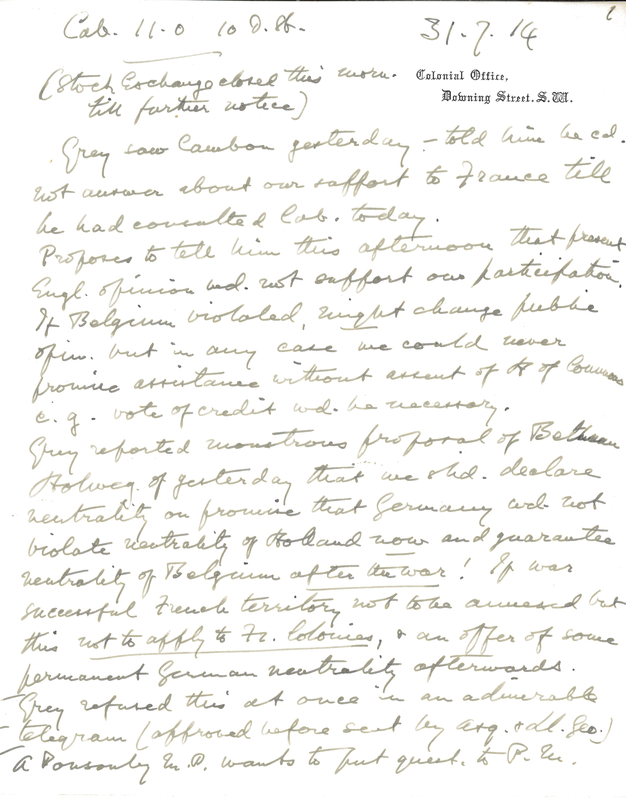 Entry for 31 July 1914 from the political journal of Lewis Harcourt (page 5). 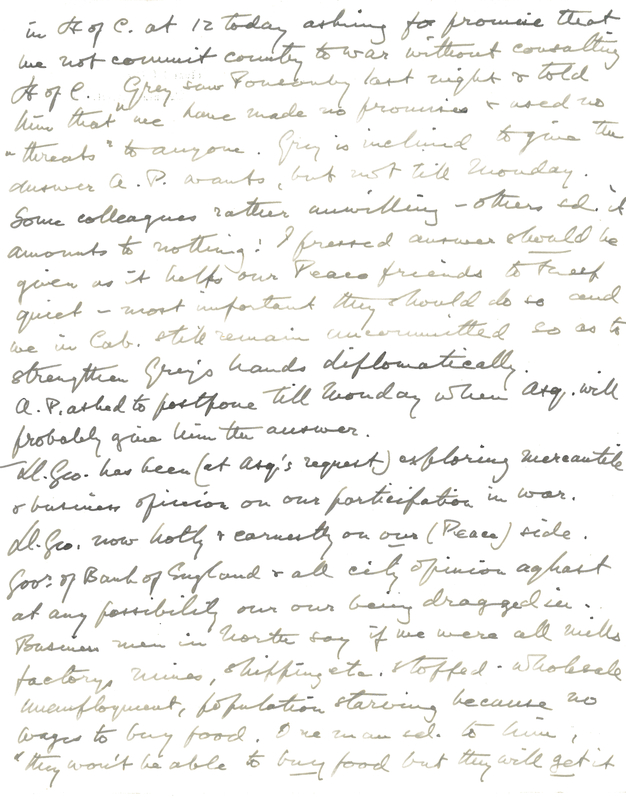 Entry for 31 July 1914 from the political journal of Lewis Harcourt (page 6).